Kevin Huizenga began making mini-comics in high school in the mid-’90s, and by the start of the 21st century, he had developed a reputation as one of the best of his generation of alternative cartoonists, hailed for his formal experimentation and his ability to capture the poetic wonder of modern life. Though Huizenga’s comics have been released by different publishers, and in formats ranging from anthologies to pamphlets to hardcover books, many of his stories have featured the same character: Glenn Ganges, a youngish, middle American everyman prone to drop into reveries while going through his ordinary day of working, shopping, surfing the Internet, talking with his wife, and so forth. Huizenga’s latest book, Gloriana (available from Drawn & Quarterly), collects a handful of loosely related Ganges stories, previously released in his mini-comics. Huizenga spoke with The A.V. Club about his plans for Ganges, the inspirations for his different stylistic approaches, and what he still gets out of being a comics reader. The A.V. Club: Your work can be inscrutable by design. How comfortable are you with talking about what your comics mean? Kevin Huizenga: You know, I tend not to try and give away too much, or analyze too much. But I’m fine with answering some questions. AVC: Let’s start with some simple logistics, then. Do you foresee at some point collecting all of the Ganges stories into one book? Do you see them as all chapters in one big story? KH: To be honest, I’ve never even thought about that. I guess that would depend on whether a publisher wanted to do it or not. But no, I don’t really think of them that way. I think of them as separate pieces. In the beginning, a lot of the Ganges stories appeared in little trilogies. There’s the three stories in Wild Kingdom, three in Gloriana, and three in Drawn & Quarterly Showcase. Then that kind of fell apart once I started doing the Ganges series for Fantagraphics. But originally I thought in terms of these neat little trilogies, or triads. I don’t even think of there being that much continuity between the comics. It’s kind of the same character, but not necessarily. There’s not a lot of follow-through from one story to the other, where you’d have to read them in order, or anything like that. It’s just that rather than having to reinvent the wheel every time, I can use Glenn again. Like how some authors will create a new character each time, but each one is really a version of the same character. KH: Exactly. In one movie he’s a writer, and in another he’s something else, but while they have different names or different histories or whatever, they’re still kind of the same guy. With Glenn, I just figured I’d give him the same name, but leave everything else up in the air. In one story he’s married, in another story he’s not married. In one he’s trying to have a kid, and in another that’s not even an issue. AVC: So if a fan of yours sat down with all the Ganges stories and tried to map out chronology, to put them in their proper order, that would be a waste of time? KH: Yeah, probably. I mean, I put in little details, like in one story he has these trees in front of his house, and there’s all these birds in them that are making all kinds of noise, and then in another story there’s just stumps in front of the house, like the trees have been cut down. But stuff like that is totally unimportant to the main thrust of the story. AVC: Do you see yourself transitioning out of the Ganges stories at some point? You’ve done some non-Ganges work. KH: I do the Leon Beyond strips with Dan Zettwoch every week, and that’s its own thing. I’ve been doing that for a few years now. I’ve always kind of planned on doing more of the Fight Or Run?-type stories, but I haven’t really found the time…yet. I hope to do more of that in the future. AVC: You’re one of the few alternative cartoonists who still regularly produces individual comic-book issues, rather than waiting until you have enough material for a book before publishing. A lot of your peers, like Dan Clowes and Chester Brown, have gotten away from that, either because they’re not interested in the format anymore or because they say it’s financially unsustainable. Why do you stick with it? KH: Well, I’m not sure I agree with the premise of the question. [Laughs.] I just came from CAKE in Chicago, and there were a lot of actual comic books at that. Of course, they were all self-published, or mini-comics, or anthology sort of things. But it seems to me that there’s still a lot of that stuff coming out; it’s just maybe not coming out “officially,” or getting wide distribution. And there’s a lot of work on the Internet, too. But so far as doing work that’s not originating in a hardcover graphic novel, that’s how I started out, and that’s still how I think. It’s difficult for me to think in terms of the books—you know, those $20 books that I do interviews for? [Laughs.] For me, making comics is still the same as it was in high school. I start a new issue of something, I put whatever I want into it, and when I’m done I make some copies, and then I move on. That’s just how I think, and how I feel most comfortable working. I don’t think I’ll ever stop doing it that way. AVC: How do you coordinate working with different publishers, like publishing some of the Ganges stories with Drawn & Quarterly and some with Fantagraphics? Is that a financial necessity, to spread your work around like that? KH: That’s a hard question. Of course I want my work to be read by as many people as possible, and to get it out there to whatever extent that I can. And I’m not going to change the work to make it more accessible, so it just feels right that if someone wants to publish you, you let them. [Laughs.] And Fantagraphics and Drawn & Quarterly are a cartoonist’s dream to work with. It’s just a natural fit. As far as financial necessity, that’s more complicated. My work is not popular enough that it brings in a lot of money. It’s more than nothing. But it’s not enough to live on or anything like that. To be honest, I don’t even really think about my work in terms of whatever money it makes. That’s just a bonus. I’m just going to do the work anyway, so whatever comes back is good with me. AVC: One of the most striking elements of your comics are the abstract interludes. There’s one in the middle of Gloriana, in a foldout section, and one of the Ganges issues begins with a lengthy wordless sequence, riffing on videogames. What do you like about kind of non-narrative cartooning? KH: I was thinking about that today, actually. When I was in high school, there was a zine called Destroy All Comics, and I remember reading an interview with Chris Ware where he talked about comics being like music, and that really made a big impression on me. Ever since, I’ve always thought about comics in terms of musical forms. And I guess I really like the idea of music when it has form and then sort of loses its form, or becomes noise, and then comes back again. Sonic Youth is an obvious example. Or lots of other things, jazz and so forth. That’s how I think of it: structure turning into noise and coming back around again. AVC: Do you see what you do more as creating a piece of visual art or telling a story? AVC: What about your use of—for lack of a better word—diagrams? You, Dan Zettwoch, Chris Ware, and a lot of other contemporary cartoonists do a lot with page design, leading the reader’s eye to different places and mapping out information. You have a long section in Gloriana, for example, where Glenn Ganges gives what amounts to an astronomy lecture. What draws you to that? KH: I’m just super into diagramming. When I moved to St. Louis, I moved here for a job, working with a company where we made diagrams to explain things to people. A lot of times it was explaining software, and that was the first time I was really immersed in diagrams. I realized that it’s a whole world. There’s all kinds of diagramming in science textbooks and medical textbooks, and that became very interesting to me, because you start to see all the potential for mapping out something that you might not otherwise be able to visualize in your head. When you read prose—especially nonfiction—you’ll find that sometimes they’re trying so hard in paragraphs and sentences to create a mental picture of physical relationships. Like, how locks and dams work, or something like that. You just think, “Oh, this plus a diagram would be so helpful.” Just in terms of understanding it—seeing it in your head more quickly. So I became very interested in diagrams back then. The other thing is that there is a way in which all comics involve a lot of diagramming. That’s just not always given a lot of emphasis. Comics are showing you spatial relationships. It’s not just a picture you’re looking at; you’re looking at a diagram of what’s going on. You’re looking at some simplified icons, and you’re looking at word balloons and thought balloons that are incorporated into the composition. You’re not reading them as pictures; you’re reading them as symbols that carry information. Textual information, not pictorial information. So there’s a sense in which I think it’s natural for a cartoonist to be interested in diagrams, just like it’s natural for cartoonists to be interested in graphic design. You’re designing a page, and you’re designing a world, and you’re just doing so much design work as a cartoonist. That’s a whole other set of skills you have to learn, besides the skills of writing sentences and the skills of drawing pictures. You also have to think about how to put it all together, so that it works together as a package. AVC: You and Zettwoch both live in St. Louis. 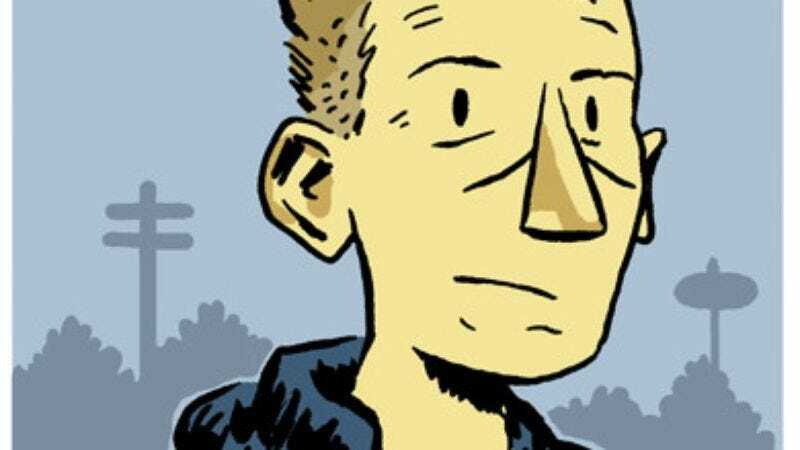 Do you get together a lot the way that the Toronto crew of Seth, Chester Brown, and Joe Matt used to? To buy comics and bounce ideas off of one another? KH: Not bouncing ideas so much, but we try and get together every week. And we’ve done that for many years now. I mean, I’ve known Dan since I moved here in 2000, and Ted May, too. So I see them a lot. We talk a little about comics we’re working on, but not a lot, because I feel we have a handle on what we’re doing. Me and Dan and Ted get along pretty well, but we’re not reading each other’s work and criticizing it, or getting suggestions. Me and Ted go sometimes to a show in town where collectors have all their long boxes, and buy crappy old comics and have fun reading them. But it’s not quite as intense as those Canadian guys, I think. [Laughs.] Not the same. AVC: How much actual comic reading do you do? KH: A lot less than I used to, and I know that’s bad. Whenever I do sit down and read a lot of stuff for a couple of days, I definitely feel, you know, “new comics energy” coursing through me. I feel like, “Why don’t I do this more? Why don’t I spend more time reading?” I’ve kind of drifted away from comics to reading stuff on the Internet, watching TV shows, or playing video games. But I really do try to set aside time for reading comics, because I think it’s super-important for doing my work. It helps me think in terms of comics, and inspires me. When I talk to other cartoonists, we always complain about how we’re suffering with whatever we’re working on, and I always say that I find it helpful to read comics, and really go through a bunch of stuff—especially bad or mediocre comics. Because your brain kicks in and says, “What would I have done here?” There’s also the helpfulness of reading something that’s not very good, and feeling, “Oh, I can do better than this.” [Laughs.] As a confidence builder.